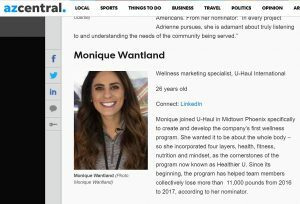 U-Haul already knew its talented wellness marketing specialist, Monique Wantland, was an up-and-comer on the Valley’s health and fitness scene. Now others are taking notice. Wantland, 26, was selected to the azcentral.com 2018 “Who’s Next” list for health and fitness experts who are helping people live better. 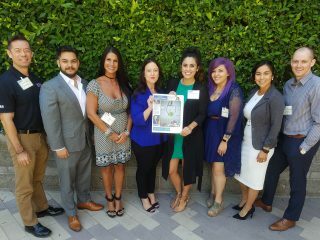 The list encompasses young professionals under 40 in the Greater Phoenix area. View the azcentral.com list here. 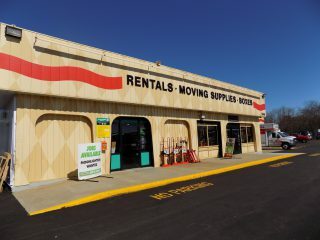 Wantland was hired in February 2016 with a broad objective never before assigned to anyone in the Company’s illustrious history. Her job was to devise, develop, grow and market the first U-Haul wellness program. 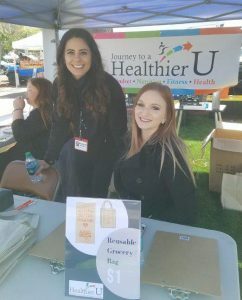 The program, which became known as Healthier U, was the result of a wide-ranging initiative to assist 28,000-plus Team Members and 20,000-plus U-Haul neighborhood dealers across the U.S. and Canada in becoming healthier, fitter, and improving their overall wellness. 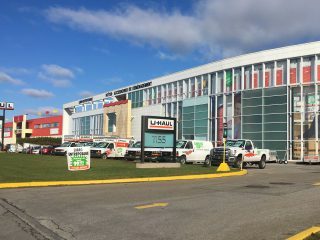 “U-Haul has made it possible for this wellness program to be as successful as it has become,” Wantland said. “Everybody has embraced the culture of health and embraced the positive healthy changes. When Wantland accepted the role of wellness marketing specialist, she understood that creating a wellness program was not about looks. It was about the whole body. So she incorporated four layers – health, fitness, nutrition and mindset – as the cornerstones of Healthier U. These layers capture all wellness aspects, ranging from physical fitness and diet to work optimization and financial health. Wantland formats Healthier U to be diverse so that everyone can find a reason, and a way, to participate. Consequently, Team Members can receive gym reimbursements for regular attendance. Also, registered dietitian reimbursements and nicotine cessation became available. The process of shaping Healthier U required consulting with many professionals who perform jobs of a similar nature at other companies. Wantland searched out the best corporate wellness programs and learned what was working for them – and what wasn’t. In the first year of Healthier U, Wantland introduced an 80:20 ratio for the Company’s suggested nutrition philosophy. This entails eating healthy, nourishing foods 80 percent of the time while allowing for indulgences 20 percent of the time – a sustainable approach. 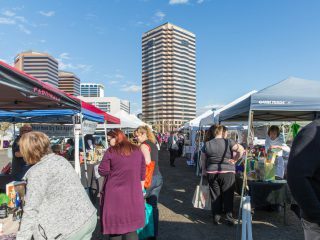 This required Wantland and her team to change the vending machines at U-Haul locations, overhaul the menu of Anna Mary’s Café at corporate headquarters, and implement healthy food policies for meetings, work anniversaries, celebrations, etc. 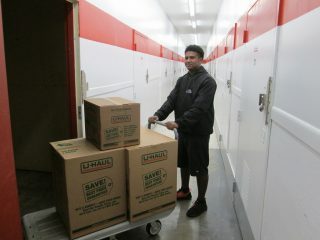 One of the most recognizable activities Wantland has spearheaded is the creation of U-Haul Active Day. 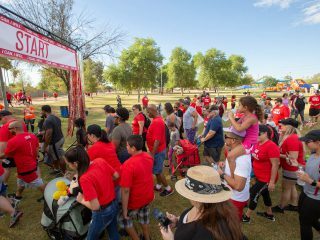 This system-wide initiative gave individual U-Haul Companies across the U.S. and Canada, as well as U-Haul dealers, the chance to gather their teams, families and friends for a fitness-centric event that offered everyone a day to be active. 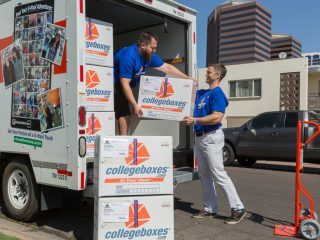 Since Wantland came aboard, U-Haul has been honored for: 2016 Healthy Arizona Worksites (HAWP) Gold Recipient; 2016 American Heart Association (AHA) Bronze Fit-Friendly Worksite; 2017 HAWP Gold Recipient; 2017 Phoenix Business Journal – Healthiest Worksites (No. 9 in Metro Phoenix among large companies); and 2017 AHA Gold Fit-Friendly Worksite. 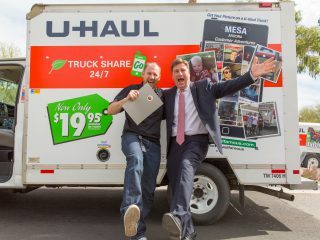 Stats worth noting since Wantland joined U-Haul include: Team Members collectively lost 11,159 pounds from 2016 to 2017; 2016 Active Day saw about 800 Team Members and their families participate, while 2017 Active Day saw more than 2,900 Team Members and their families participate; at the 2017 U-Haul health fair, 878 attending Team Members received 202 flu shots, 139 health checkups, 124 mobile on-site mammograms, and 22 prostate screenings. Wantland is just beginning her pursuit to make U-Haul a healthier company. Currently, she is developing a U-Haul fitness line so her coworkers can purchase branded Healthier U gear. She is also getting NASM certified, and continues to work closely with the AHA, ADA and HAWP. 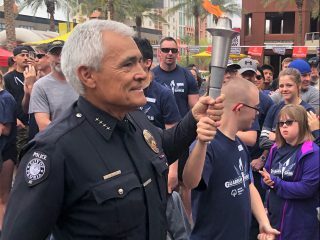 Her results to date indicate she was the right candidate for the position, and worthy of azcentral’s 2018 “Who’s Next” recognition.